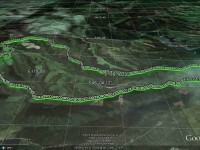 Livingstonia Park distance from car-park: 31.5 km. 27/2/2019. 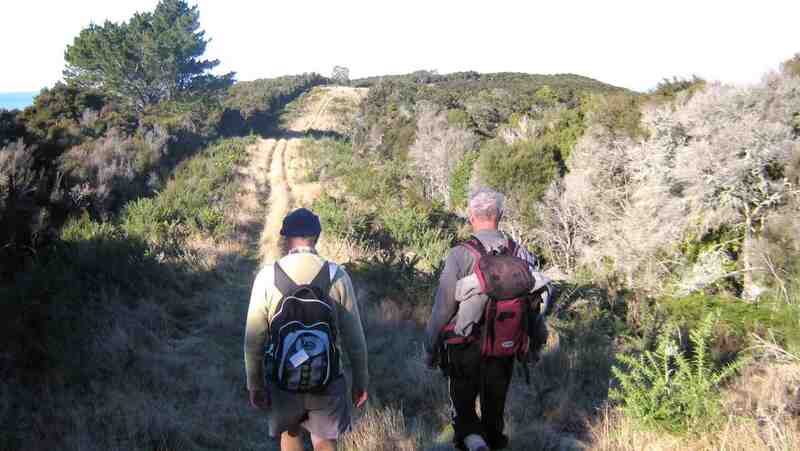 Hikers. 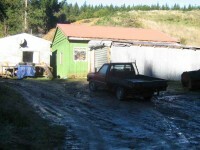 Sawmill-Coutts Gully Roads. Leaders: Clive and Francis. 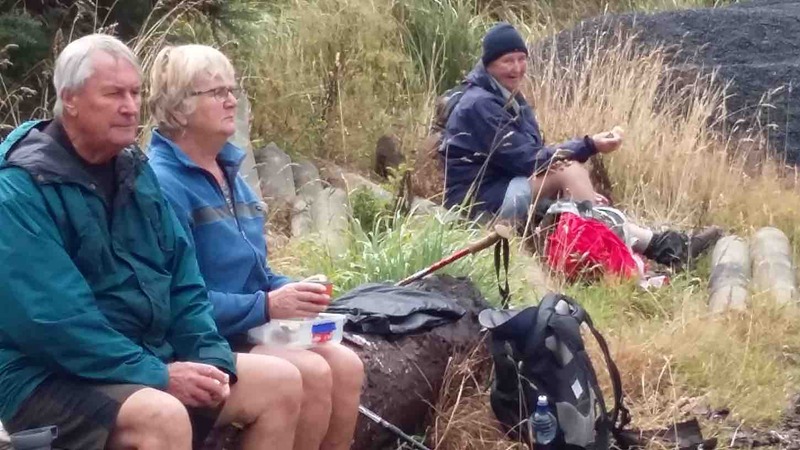 22 Hikers and ramblers arrived at Livingstonia Park in time for the rain to set in. 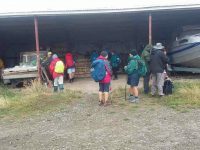 The hikers set off along the beach in a bracing breeze and made their way in a loop up to Alan Gartons’ farm at the top of Sawmill Road. 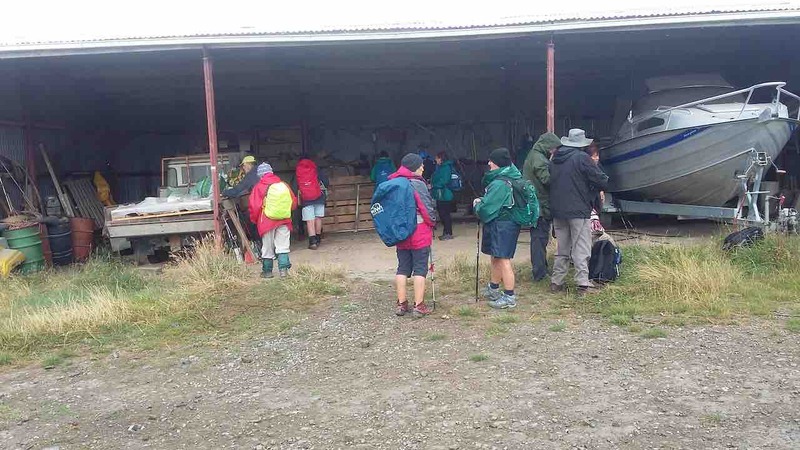 Alan offered us shelter in an a barn to have our morning tea out of the elements. All refreshed we set off Westerly in what was remembered as a more level walk. (it got quite steep in places). After passing several points remembered from the earlier visit we struck off towards Coutts Gully Road and the paper road extension. Several spots were greasy under the steady rain and a few ended sitting on the track!. 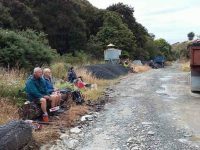 Just as the rain eased we turned East along Coutts Gully Road and reached the old sawmill about 12.30pm, in time for lunch in warm sunshine. From there it was a straightforward walk along the formed road back to the cars and onward to Brighton for afternoon tea. – Clive. The four of us first fortified ourselves with a leisurely morning tea at Livingstonia Park. 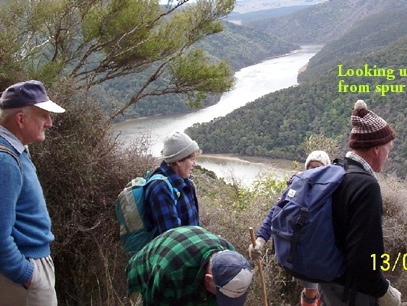 We then motored off in search of a faintly-remembered-by-Ian Livingstone-Green family bush walk. First try: Sawmill Road. Surprise! 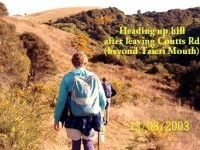 Ahead, the Hikers. 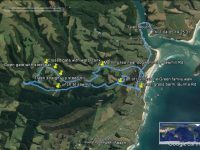 Nothing to do but to gaily sail past to find our bush walk but it was not on that road. 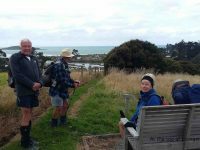 Returning back down to the Hikers with what dignity we could muster, we enquired of Leader Clive who confirmed it was on the other road, – Coutts Gully, – so we retreated thence. Only to realise when we arrived, the extreme narrowness of both board and track, a bit unnerving for some of us to tackle. Anyway, it was too hilly as well. 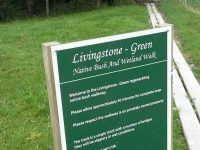 We walked back up the road to the aforementioned Livingstone-Green walk entrance to lunch under a rain-proof tree which sheltered us from a brief shower. Well… What now? 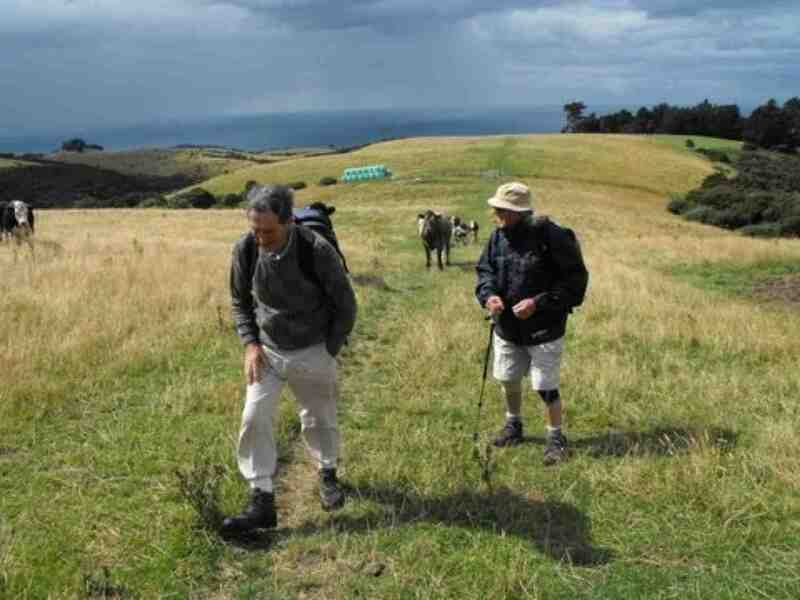 What else, but to precede the Hikers with coffee at Brighton, and then home. – Ian. 19. 5/4/2017. Both. 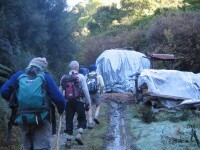 Sawmill-Coutts Gully Roads. Leaders: Bruce and Marjorie. 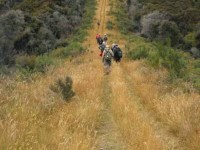 Eighteen hikers and trampers set off from the grass berm in Burma Road after most of the cars parked on the berm. 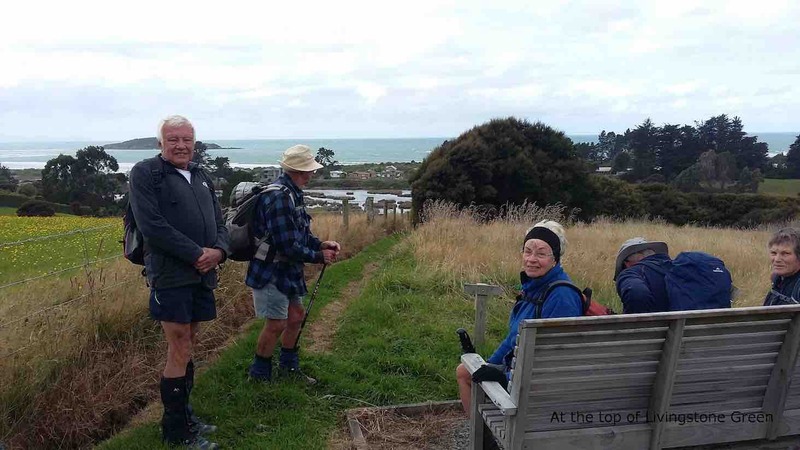 Five hikers, including Les, Margaret, Leslie and Bev made a separate excursion in the area. 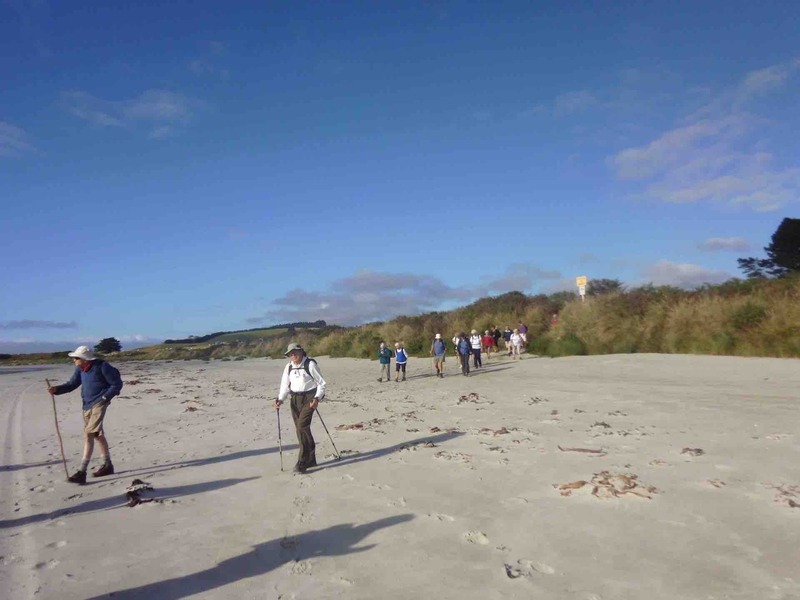 The main group walked beside the trees on the beach side of the park and then followed a track through the sand hills to Moturata Road near the bridge, following the 2 signposts with first a turn to the right and secondly a turn to the left. We crossed Moturata Road where the track emerged and then walked 50 m to Sawmill Road on the left. 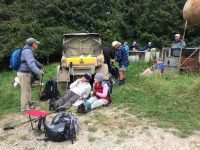 We proceeded up this road and stopped for morning tea just past the house of the farm owner, Alan Gorton, through a gate and just before the dog kennels. … rather than following a bulldozed track to the left. 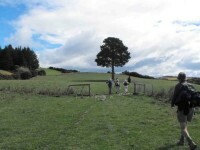 At the top of paddock was an open gate with a steel bar attached to it. 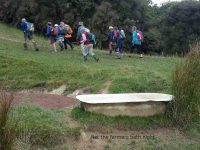 We went through the gate and continued to the next gate which was closed and had a plastic water tank with sides about 1.3 m in length. We went through this gate and then turned to the left and proceeded in a straight line through a further 3 open gates, noticing a bulldozed track down the hill to the left but not going towards it. 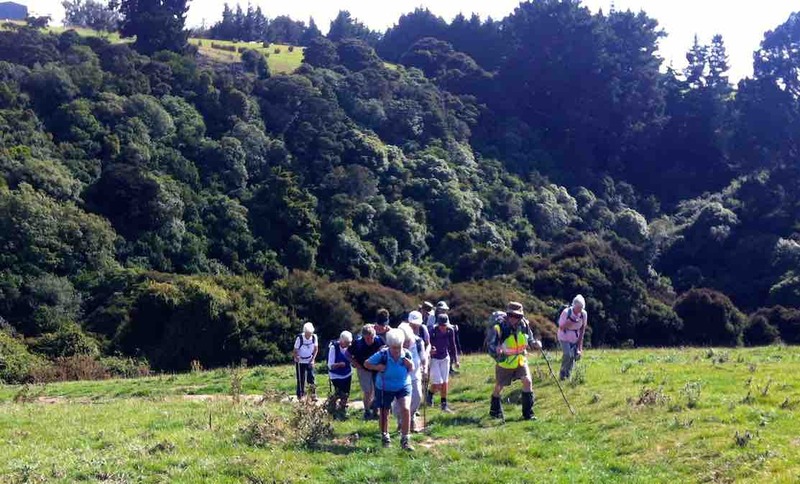 At the top of a brow of the hill, at the end of the straight line of travel, there was bush ahead and soon a grassy track was visible to the left which we went along for 100 m. We then noticed the start of the bulldozed track on the right which led down the hill through bush. 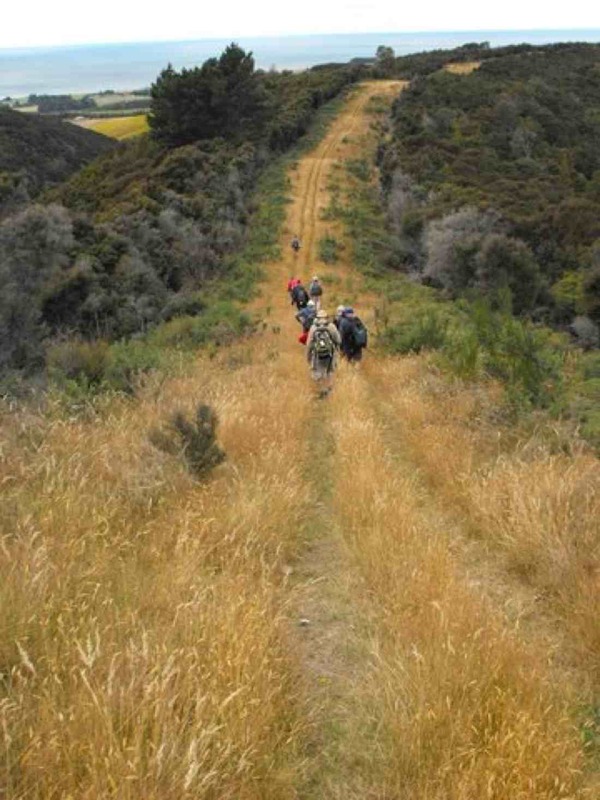 The start of the track was not easy to see until we almost reached it because of the slope of the hill. 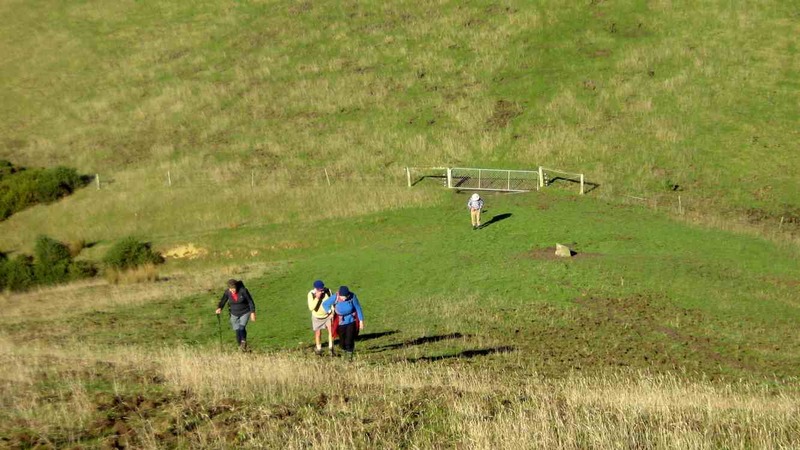 The bulldozed bush track crossed a stream and then went up hill to reach a grassy paddock. We turned sharp left here and proceeded along Coutts Gully Road. The road in its upper parts is just a narrow path between some gorse bushes. We closed the Cyclone gate some distance along and erected 2 netting fences, with plastic bags on them, which were there to keep stock in. We had lunch at the sawmill further down the road. … with a loop at the end. We went to the right side of the loop. The rest of the group proceeded back to the cars. The last of the bushwalkers reached the cars at approximately 2.15 pm. 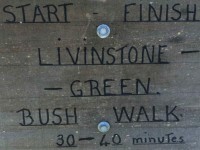 The distance was approximately 11.5 km without the bush walk and 12.5 with the bush walk. The weather was cool but the rain that had threatened in the forecast some days previously did not eventuate. – Bruce and Marjorie. 18. 4/3/2015. Both. 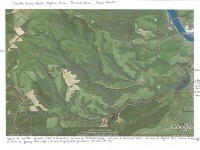 Sawmill-Coutts Gully Roads. Leaders: Bruce and Marjorie. 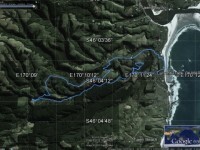 Garmin 62S GPS of route, courtesy Bruce. Distance travelled: 12.68 km, moving time 3 hrs 43 mins, stopped time 1 hr 35 mins, moving av speed 3.4 km/hr., overall av speed 2.4 km/hr. 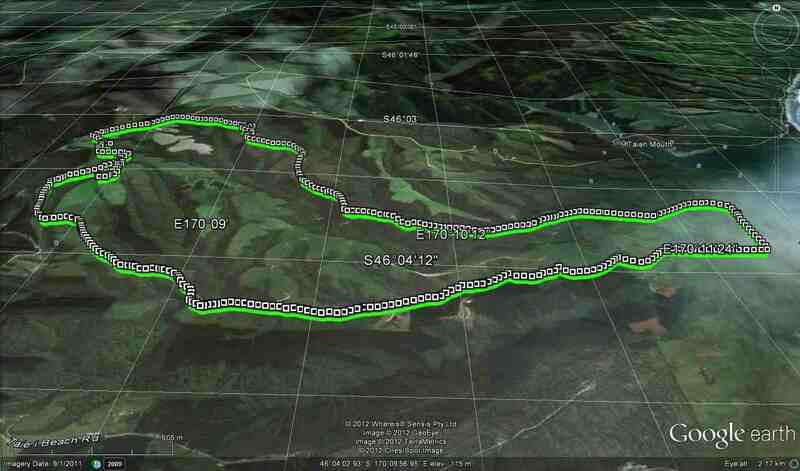 A grosser GPS of route, showing rough kilometers. 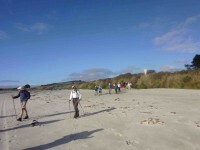 Twenty-seven trampers and hikers, including two guests from Wales who had been on the Turf to Surf cavalcade walking group, Jeremy and Mary, departed from Livingstonia Park, Burma Road, Taieri Mouth, at 9.45 a.m. on a calm sunny morning via the marked beach access track closest to the Burma Road entrance. We proceeded north along the beach and turned to the left to the white marker pole on the beach edge which led to Moturata Road, just before we came to an assembly of some hundreds of seagulls, or, in the view of George, terns arranged in a square like a cohort from a legion of Roman soldiers. 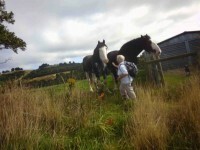 …that were patted and fed some grass by Chris. 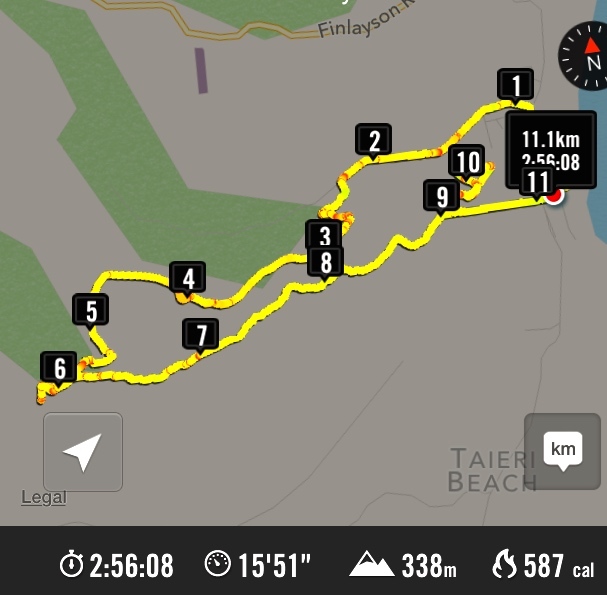 …which gradually led further up the hill. At a gate some distance up the hill near a bush gully we veered to the left to go through another gate. 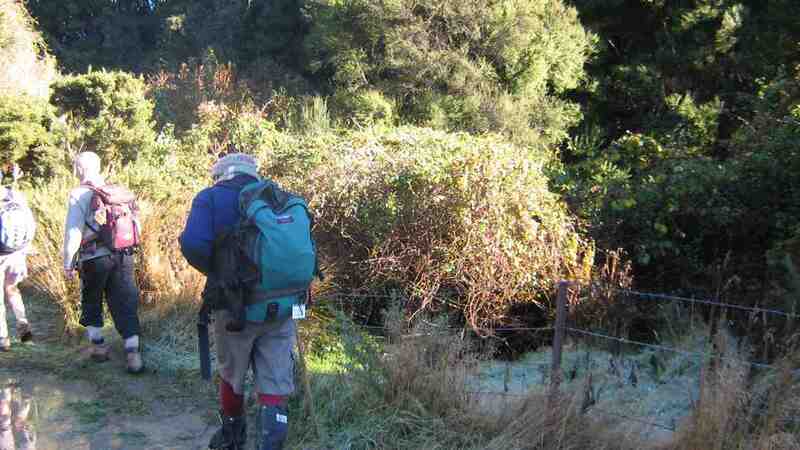 After cresting the hill brow and passing a further gate we climbed another undulation and on the far side of this came eventually to a greenish track that led into the bush on the right. We noticed a further gate away to the left but did not go to it. 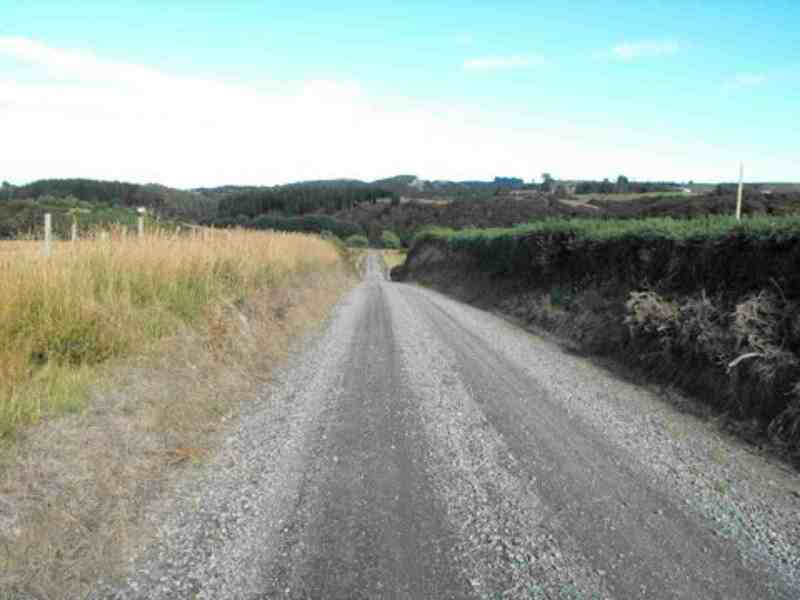 The bush road was also somewhat rocky and steepish. 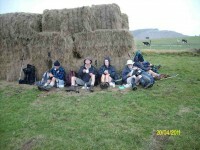 At 12.05 pm we stopped for lunch near a corner of the road at which a bank with a rocky backrest provided some seating. Proceeding again at 12.45 pm, we descended further and then gradually climbed up the other side and out of the bush into farmland. 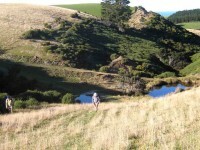 The exit was adjacent to the upper part of Coutts Gully Road which continued towards the top of the hill via a gully on the right. 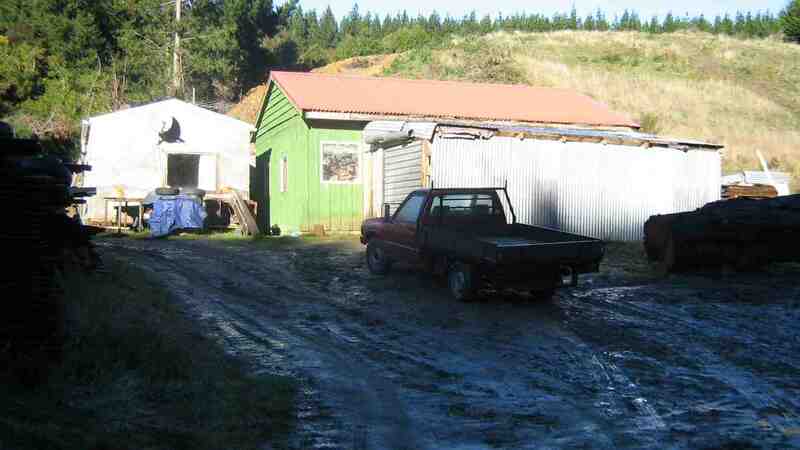 We took the part of the road to the left and descended down towards an old truck parked in the bush on the left side of the road and the sawmill. The initial part of the road was a relatively narrow gap in the gorse. We then came to a Cyclone gate and subsequently a netting gate. 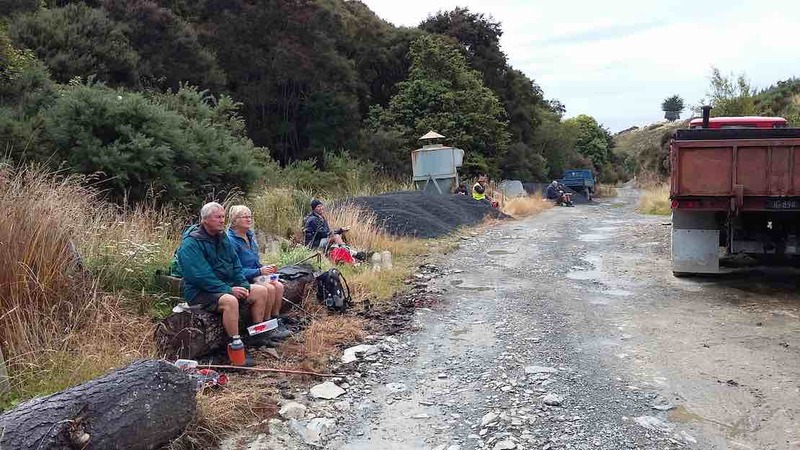 Several birds chirped in the QE2 covenanted bush, including melodious korimako (bell birds), on the left of the road. Piwakawaka (fan tails) flitted around in the trees. 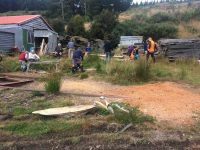 After passing the sawmill, which had a pile of fresh sawdust indicating it had been recently used, we continued down the road until it emerged from the bush. 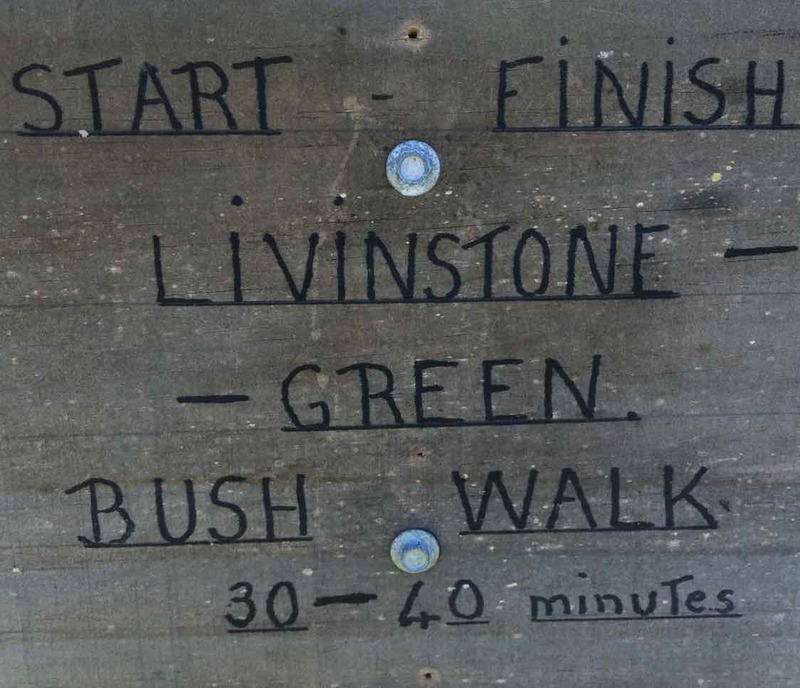 Then on the left, we had the option of doing the Livinstone-Green 30–40 minute Green Family bush walk. 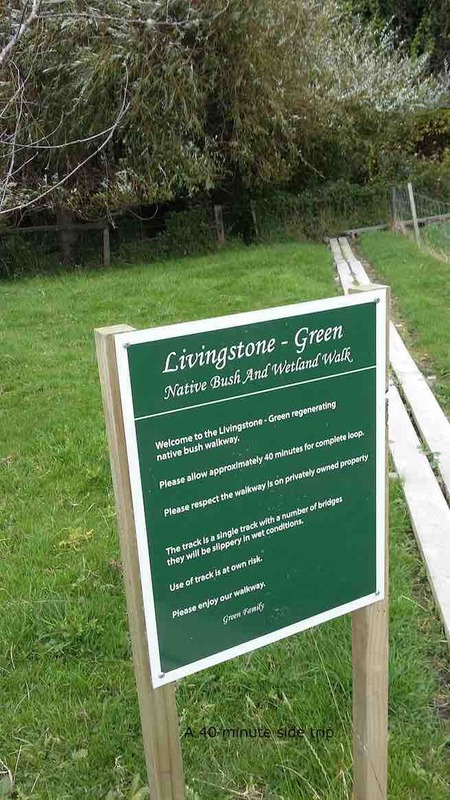 Sign indicating walk through QEII reserve on Coutts Gully Road. 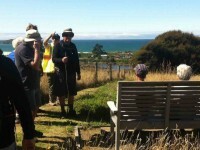 The seat at the to of the QEII bush walk. Moturata Island in the background. 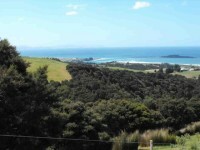 set in a turquoise sea, from near the top of the loop track near the end of the bush track. The grass track up to this along the fence line had been recently mown. 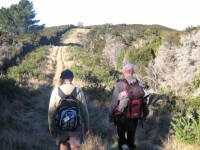 We then proceeded back to the start/finish of the bush track. 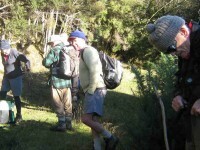 The final portion of the walk was along Coutts Gully Road and Burma Road to Livingstonia Park, where we arrived back at approximately 3.30 pm. – Bruce. 17. 22/1/2014. Trampers. 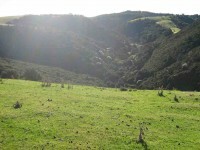 Coutts Gully, Sawmill Road. 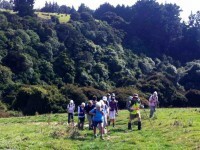 After explaining to everybody about the possibility of coming across some bulls, and bees, we set off up Coutts Gully Rd. 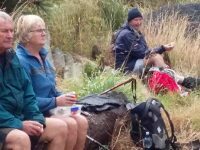 Had morning tea in the usual spot at the pine trees where a side road branches off, then went on to tackle the climb to the top road. After climbing through the top fence, we were surprised to see some bulls in that paddock, as I was under the impression that they were in the paddock we wanted to go back down through. However, we gave them a wide berth, & pressed on regardless, with only one or two showing any interest in us, with most of them moving quickly out of our way. I must say I breathed a sigh of relief when we finally reached the top road, & the safety of the gate. There was certainly a “lot of bull in that paddock”, with probably 50 or so animals. As we had safely negotiated the bull paddock, we then stuck to the original route down Sawmill Rd. At this stage it was starting to get a little cooler, with a breeze, so we decided to get down into the shelter of the pines for a lunch stop. After lunch we walked down Sawmill Rd. 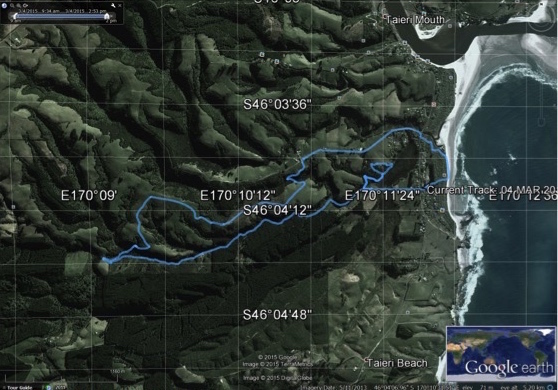 [which is just a 4WD track at it’s top end], and spooked a couple of deer on the way down. From the bottom of Sawmill Rd. it was a short walk back to the cars. 16. 21/3/2012. Trampers. 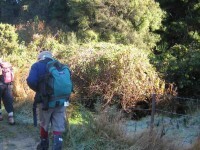 Coutts Gully, Sawmill Road. Six of us trampers took to the hills behind Taieri Mouth, via Coutts Gully Rd. 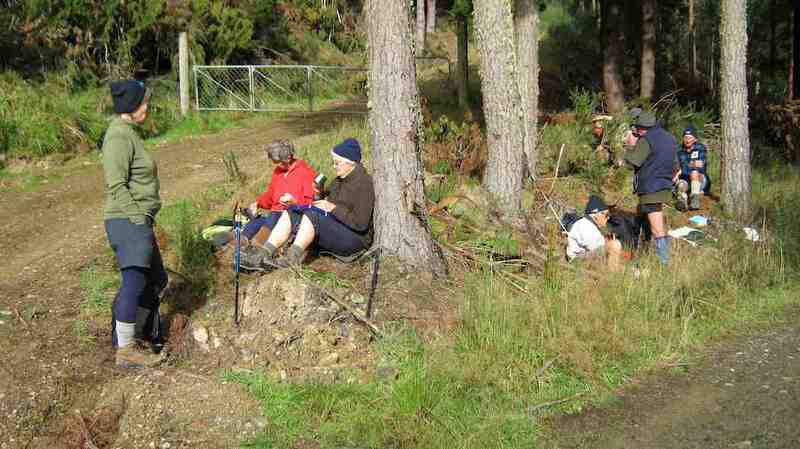 We had morning tea at the normal spot under the pine forest, then tackled the rather steep climb up to the tops. Two of us decided to go the longer, more difficult way up, while the rest took the easier route. However when Neil and I reached what we believed to have been the agreed lunch-spot, the others were not to be seen. After a half hour spent looking for them, we had lunch on the top where we could get a good view all around, but saw no sign of them at all. As we were finishing lunch, we got a phone call from the others asking if they could go on!!! 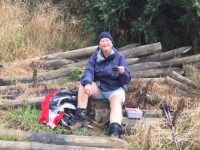 After joining up again, we made our way back down to Taieri Mouth via a track down a ridge, onto Sawmill Rd, & back to the cars. – Ken. 15. 20/4/2011. Trampers. 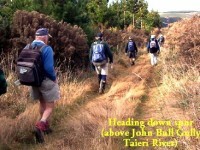 Coutts Gully, Kennedys, John Bull. Car shuttle. M.
Route GPS. (Courtesy Ken). 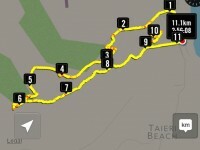 14.56 km in 4h 23m. 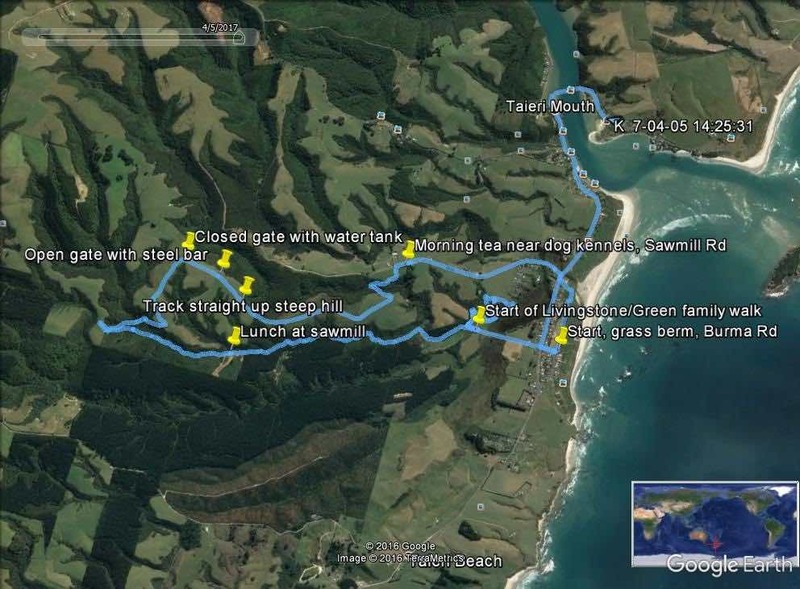 (4.4k/h in 3hrs 20m actual tramping.) Max elev. 305m. There were 9 of us on the day. A good number. Upper Coutts Gully Road quite muddy after recent rain. Occasional light skiffs of rain, and some sun on the day. 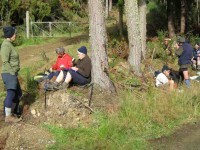 Tea break, well up Coutts Gully track. Lunch at top. 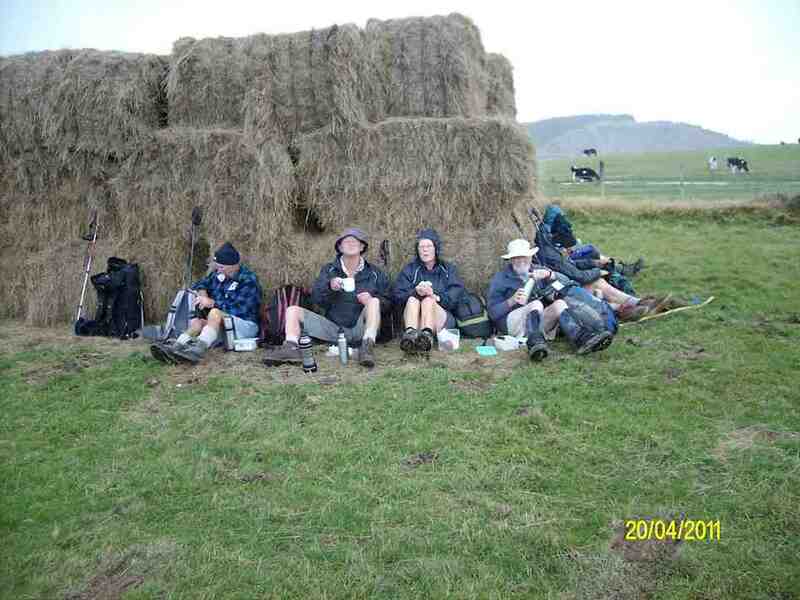 Sheltering from the skiffs of rain and shifting wind. After this was the walk out to Finlayson Road, along to Kennedys Farm and down to the seat on the John Bully Gully track. Down in the bush the track very muddy and deteriorating in places, especially THE muddy broken-stepped patch. – Ian. 13. 9/6/2010. Trampers. Coutts Gully Road, Finlayson Road, Sawmill Road, Taieri Mouth.Leaders: George, Bob. 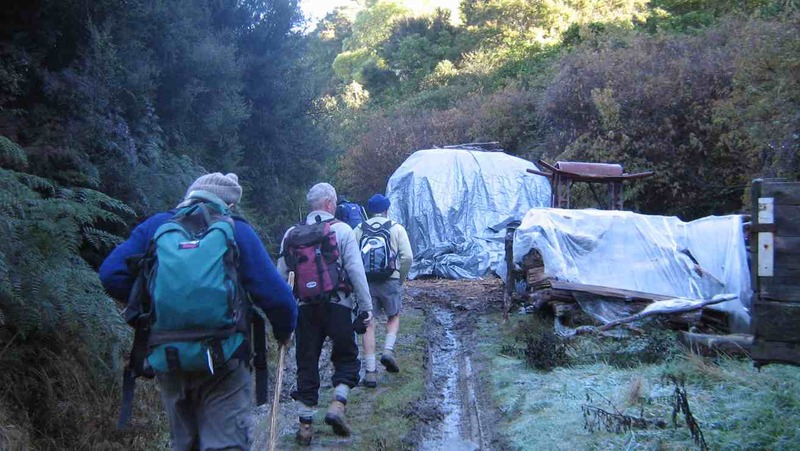 Coutts Gully road was wet a muddy on the first sunny day after a series of wet ones. 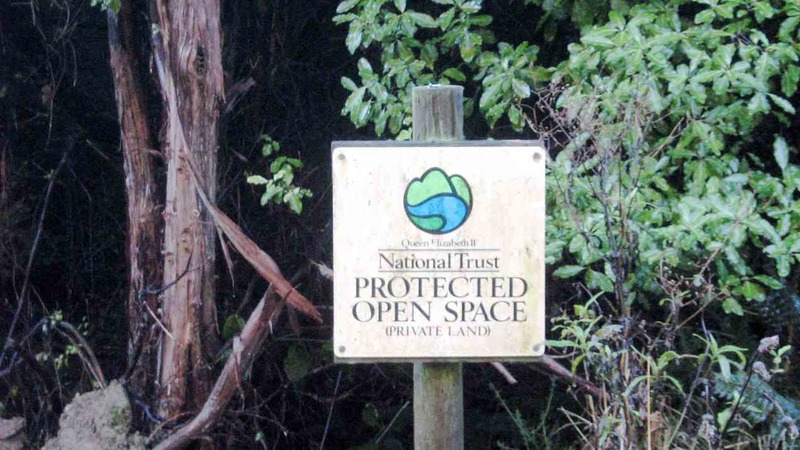 We discovered as we went further up that the track was now a National Trust protected open space. 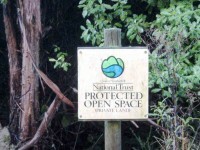 Coutts Gully track now a protected open space. Yet further up and a reminder of the sawmill in Coutts Gully. Sic transit gloria, mutatis mutandis, or plus ca change plus c’est la meme chose, or something not at all like that. Anyway, a track off to the side, which we used to take, was discovered to be no longer viable. Quite overgrown. We found that the entrance to a track we had formerly used was now overgrown. You can see just how muddy the track was, as we edged past stacked wood, well-shrouded against wet winter weather. 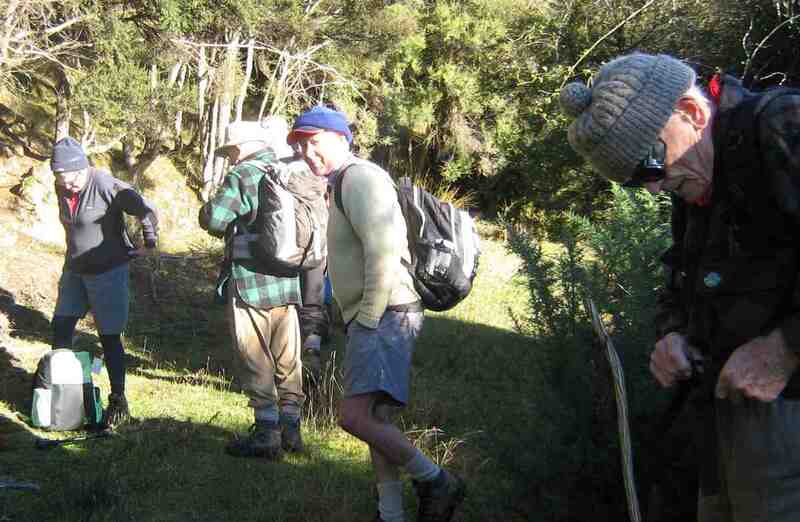 Our trekking hitherto had been in gully shade. Now out into the sun, it was time to remove extra clothing which the cold morning’s start had necessitated. 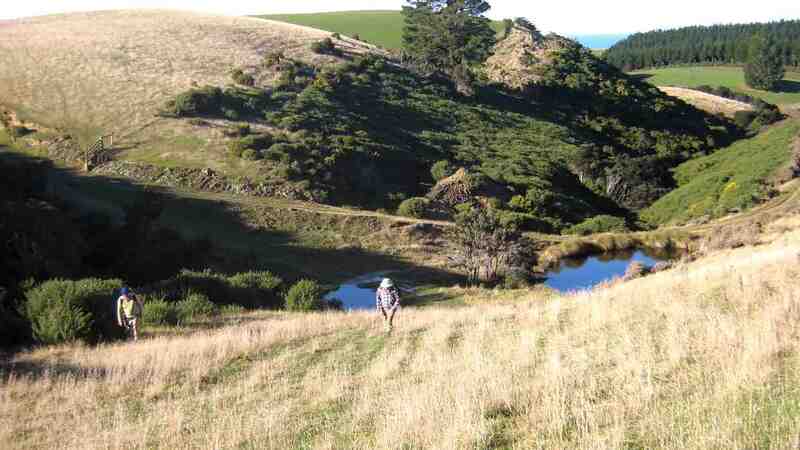 Out into higher open paddocks, but the climbing became much steeper than the more gentle gully incline. Then it was grudgingly down into a dip, to cross over to a yet more arduous extended paddock climb. 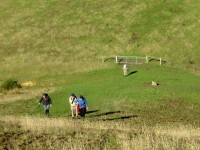 Rain had soaked the sheep-nibbled grass to make steeper slopes very slippery also. As we continued to make our way down, looking back into the sun, we could detect through the bush a track we had taken on one or two former times to take us through a gully from another ridge to this one. 12. 3/3/2010. Both. 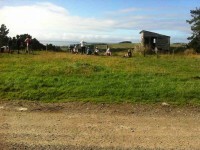 Coutts Gully Road, Finlayson Road, Sawmill Road, Taieri Mouth. 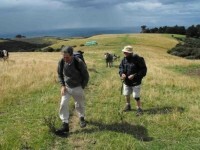 Leaders: George and Bob M.
and back on a pleasant summer’s day with distant views to Cape Saunders for the baker’s dozen who did it (perhaps the previous week’s walk had worn some out?). and in a warm enclave among hawthorn and macrocarpa. 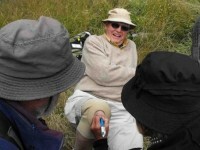 Here George held a remembrance observance for Ngaire Moir who passed away this week. 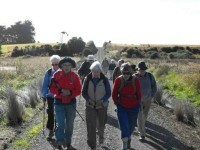 People remembered her as having been on this walk many years ago when she was active in the club. Our sincere sympathies were expressed for Doug and the family. From this point, we rose by degrees to the Skyline Road which gave us vistas both east and west. A group of friendly cattle walked with us at one point. After only 15 minutes or so along the top we turned through yet another gate and took a downhill route along a different spur. 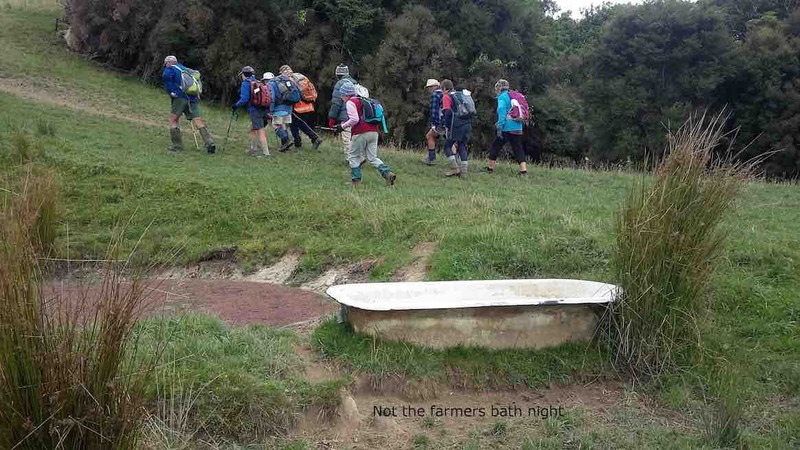 There were more friendly/curious cattle, a little club of sheep with one solitary goat who’d joined them as a fully paid-up member, and at one stage George rounded a fenced bend and unexpectedly drafted a flock of sheep back towards us down the path. 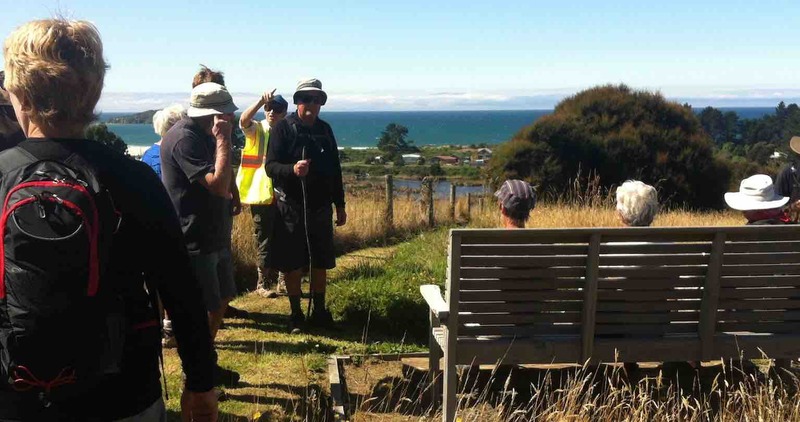 Then came perhaps the nicest stretch of the walk along a ridge top sheltered by manuka on both sides but through lovely summer grass along a quad bike path. From the open pastures that followed, we had good views of Moturata, Green, and White Islands, Sandymount, Saddle Hill, and the whole Dunedin coastline north. 10. 13/8/2003 Trampers. 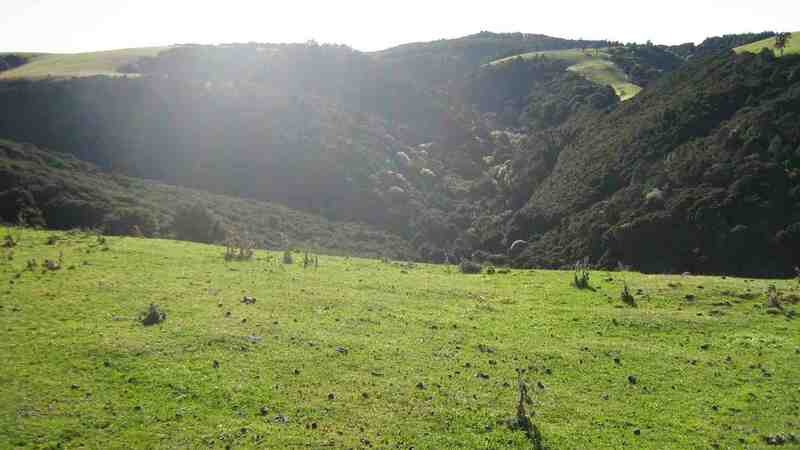 Coutts Gully, Kennedys Farm, Taieri River. Medium. Leaders: George, Joyce. 9. 3/6/1998. Coutts Gully, Sawmill Road. Leaders: Dot B, Joan H.
8. 26/3/1997. Coutts Gully Sawmill Road. Leaders: Doug and Ngaire, Frank. 6. 21/6/1995. 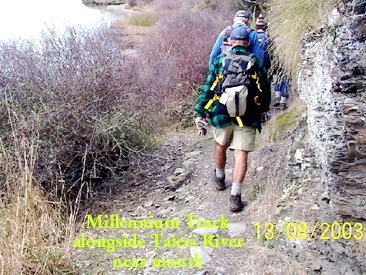 Sawmill Track and Coutts Gully. Medium. Leaders: Eric and Dot, Joan H, Chris. 4. 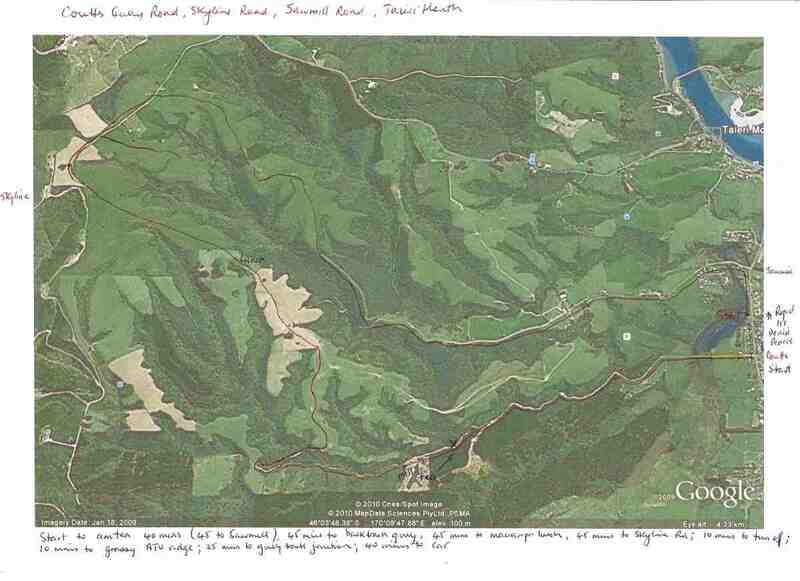 20/2/1991 Sawmill Road – Coutts Gully. Good tramping and views. Average. Leaders: Eric and Dorothy, Jean, Joan. 3. 9/5/1990. 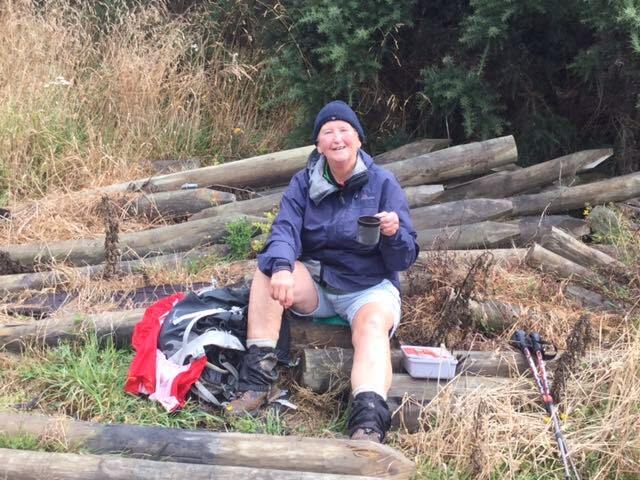 Coutts Gully tramp, Taieri Mouth. Average. Leaders: Denise, Jean, Dorothy and Eric, Ria.